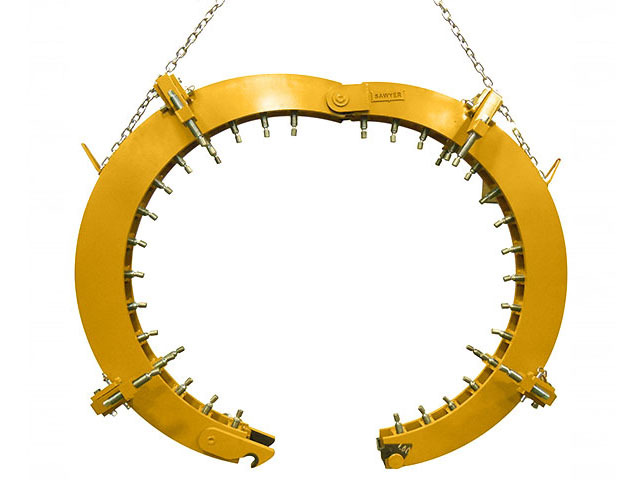 Much like the Rim Clamp, the Sawyer Ultra Rim Clamp is designed for use on out-of-round pipes requiring a high level of alignment accuracy, but the Ultra Rim Clamp is a heftier pipeline welding clamp than the previous model and is built to align and reform X65, X70, and X80 pipe with wall thicknesses up to 1 3/8″ (35 mm). It is capable of reforming pipe with an out-of-round condition of up to 2″ (51 mm). Available in a range of sizes to accommodate pipe sizes from 4” to 72”, this alignment rim clamp tackles a wide variety of pipe-to-pipe fit up jobs. The Ultra Rim Clamp offers extreme reclaiming capability, readily reforming high tensile pipe. Modern materials allow this alignment rim clamp to be lighter and stronger than its predecessors with improved component parts, giving the lineup Ultra Rim Clamp better accuracy and a superior finish. The multiple jackscrews on this pipe clamp give the user the ability to apply precise reforming pressure on the exact areas of pipe most in need of it. The specialized torque wrench supplied with the Ultra Rim Clamp furthers this capability by allowing the user to set the exact torque required for the reforming application, saving time and effort by setting the perimeter of the jackscrews before the external line up clamp is placed on the pipe. The hinged flip-up jackbars on the Ultra Rim Clamp allow for simple pipe mating, and also ensure this external line up clamp can be used for applications requiring 100 percent welding and/or grinding without removing the pipe clamp. Each heavy duty jackbar also comes with a pivot pad, allowing this pipeline welding clamp to be used on coated or uneven pipe surfaces. For durability and dependability, the Ultra Rim Clamp is unsurpassed. The pivot points of this pipe clamp are made from stainless steel so one clamp will work for all pipe applications, eliminating the potential for pipe contamination. The unique jackscrews on the Ultra Rim Clamp are trapezoidal, which are superior and stronger than conventional jackscrews, and can assert more pressure to the pipe, and the heavy-duty latching mechanism of this pipeline welding clamp ensures stability and safety on the pipe. When ultra versatility, ultra dependability, and ultra performance in an alignment rim clamp are desired, the Ultra Rim Clamp is the obvious choice.